Last night, I visited the Museums of Old York’s 23rd Annual Decorator Show House, located at 19 Harmon Park Road in York Harbor, Maine. The notation “23rd Annual” means “every year for 23 years.” As a former Show House volunteer, I stand up and applaud this group for staging a perfectly lovely show year after year. The Museums of Old York’s dedicated volunteers don’t just “show up” and “throw up” a show house every year. They do many things well. These things might not jump out to a new show house guest, but they make the event work. Key to keeping a show house lovely for a month while thousands of people traipse through is making sure there is “no smoking, food, drink, photography, pets, backpacks, or strollers” in the house. Volunteers are needed to stand in the rooms, greet visitors, and keep them from lighting up cigarettes and passing around the flask. I counted no less than 12 friendly volunteers staffing Harmon House last night. The show house guide is the “magazine” of the show house. It’s part advertising and part instruction manual. A good program guide includes a floor plan of the house and brief, relevant descriptions of the rooms and designers. This year’s Old York program guide included a small floor plan with each room description, with the particular room highlighted in blue. It was easy for me to know where I was in the house and whose design work I was viewing. This year’s show house is nestled in a cozy seaside neighborhood. While there was no parking on Harmon Park Road, there was ample free parking on Route 1A, no more than 500 yards from the house. Signs clearly directed visitors to appropriate parking locations. The garage of any show house is a difficult space to design. That’s why it’s usually turned into a boutique so visitors can bring a bit of show house magic home with them. Once again this year, the Daisy Trading Co. and Daisy Jane’s filled the garage with fun little things and fashions. Shop if you must! I visited the Show House with friends Cherie Ripperton, Lee-Annie Leonie, and Jackie Phillips. This was Cherie and Lee Annie’s first show house experience. 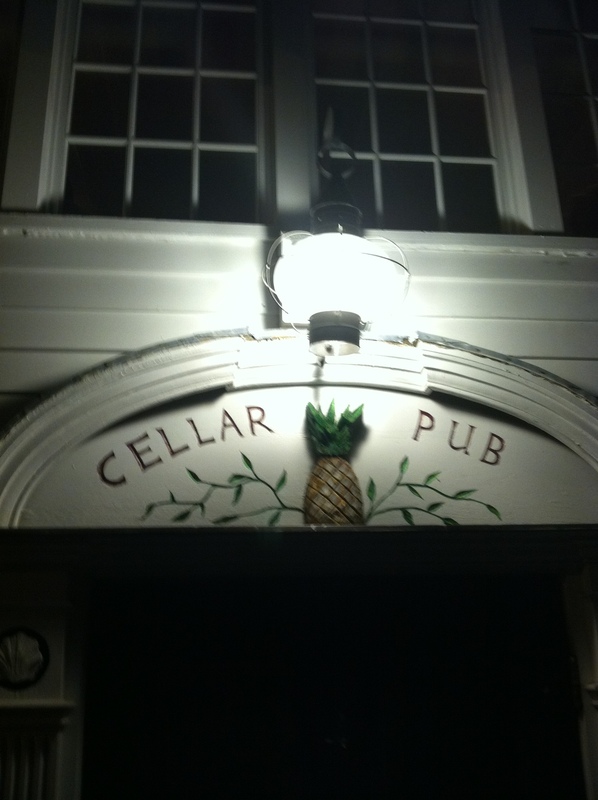 We toured the loveliness and then walked across the street to the York Harbor Inn and relaxed in the Cellar Pub. We rehashed, snacked, talked, and laughed. It was a lovely summer evening in Maine. Congratulations and thanks to the hundreds of talented men and women who helped make the Museums of Old York’s 23rd Annual Decorator Show House a beautiful success! The Museums of Old York’s Designer Show House at Harmon House runs from now until August 11, 2012. The house is open every day except Tuesday from 10:00 a.m. to 4:00 p.m. On Thursdays, the hours are from 10:00 a.m. to 7:00 p.m. and on Sundays, the hours are from 1:00 p.m. to 4:00 p.m. For more information, click here. Tickets are $20. This entry was posted in Talk of The Toile and tagged Girls Night Out, Museums of Old York, Show House, York Harbor, York Harbor Inn. Bookmark the permalink. Jackie Phillips was thrilled to be part of the group. A fun time was had by all. It’s also fun to add one more clever character to the little cabal! Wonderful night out with girlfriends dreaming of how we would decorate our own Show House if we hit it big while “living the dream” here at the Big Corporation!